In the ancient ruins of Peru and Chile, archaeologists have found potato remains that date back to 500 B.C. The Incas grew and ate them and also worshipped them. They even buried potatoes with their dead, they stashed potatoes in concealed bins for use in case of war or famine, they dried them, and carried them on long journeys to eat on the way (dried or soaked in stew). Ancient Inca potatoes had dark purplish skins and yellow flesh. skin Care: Vitamin-C and B-complex and minerals like pottasium, magnesium, phosphorous and zinc are good for the skin. Apart from that, pulp obtained from crushed raw potatoes, mixed with honey, can serve as excellent skin and face packs. This helps even curing pimples and spots on the skin.Facilitates. digestion :Since potatoes predominantly contain carbohydrates, they are easy to digest and facilitate digestion. Scurvy: The vitamin-C present in potatoes can help prevent this dreaded deficiency disease, caused due to lack of vitamin-C.
High Blood Pressure: Since high blood pressure is caused due to a number of reasons, including diabetes, tension, indigestion, nature of food and many such, different are the cures. 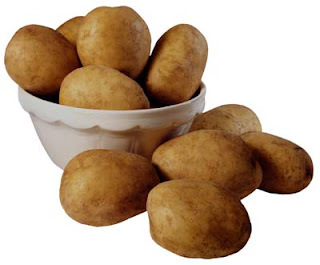 Potato can be used to relieve High Blood Pressure due to tension, indigestion etc. due to abundance of vitamin-C and B in it, but should be avoided if it is due to diabetes. Potatoes are still making history. In October 1995 the potato became the first vegetable to be grown in space! NASA called in top boffins to help them develop super-nutritious and versatile spuds to feed astronauts on long space voyages. Eventually they hope to feed future space colonies with their supercharged version of the potato the Peruvian Incas first worshipped. At first many people in Europe were suspicious of them because they were not mentioned in the Bible and some others thought they were poisonous. Potatoes are the world's fourth food staple - after wheat, corn and rice. of all potatoes is harvested in China and India. The celebration of the International Year of the Potato (IYP) will raise awareness of the importance of the potato - and of agriculture in general - in addressing issues of global concern, including hunger, poverty and threats to the environment. 2008 was also designated the National Year of the Potato in peru.